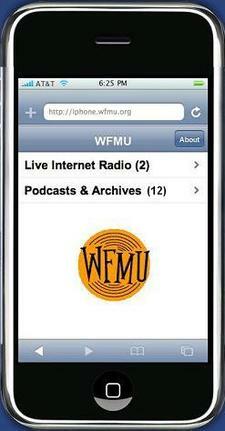 We are pleased to announce that WFMU's live streams are finally available on the iPhone. iPhone listeners can point their browsers at iphone.wfmu.org and listen to our live mp3 streams at either 128k or 32k and also choose from a selection of our archived content and podcasts. Based on our initial testing it will come as no surprise that tuning in over Wifi will get you the best results however we've also had reports of listeners with strong EDGE reception tuning in at 128k without issue. Since the Quicktime player in the iPhone has somewhat poor buffering compared with thick client-side players like Winamp and iTunes, we recommend listening to the 32k stream while connected over EDGE. For the time being we are only offering a small subset of our archived content and podcasts on the iPhone but will be adding more content as time goes by. It's a bit ironic that the iPhone, a somewhat sophisticated piece of technology (tapped as "Invention of the Year" recently by Time) still lacks the basic live radio functionality that was available on the Walkman back in the 80s and the transistor radio as far back as the 50s. It's safe to say that providing this kind of functionality has never been a technical issue for Apple but has probably been more of a business decision. A few weeks after the iPhone launched, some people discovered references to "mobile radio" in the iPhone firmware and this past Friday there were further hints that some sort of iPhone radio offering may be on its way but so far Apple is still holding back on this feature. Perhaps Apple wants to drive mp3 sales in the iTunes store or perhaps a decision not to include a streaming player was made to placate AT&T to cut down on bandwith. Other theories floated include that Apple might feel that EDGE is not the right platform on which to launch live streaming (too slow) or perhaps they simply didn't want to launch with all their features up front thus depriving Steve Jobs of yet another "one more thing" marketing opportunity. We've been looking at all kinds of options to provide a live iPhone stream since the product launched in June. Embedded Quicktime: Right at launch we were very excited to see that the iPhone had what we thought was a fully functional Quicktime player. In Safari on Mac, it's easy to embed a Quicktime player into an HTML page and play live mp3 streams. Here's a working example. Unfortunately we found that while this approach works on Safari on Mac it does not work on Safari on iPhone. While there might be some good technical reasons for why this is the case I suspect Apple simply crippled Quicktime's streaming radio functionality on the iPhone on purpose. Flash: At one point rumors were strong that Safari on iPhone would support Adobe's Flash which would have provided a relatively simple way to provide live streaming to the iPhone but so far this has not come to pass. Apple probably realizes that once they allow the iPhone to load flash content that they will lose their tight grip over what applications can be delivered to users. While Apple's recent announcement that it will be making an SDK available to developers in February does suggest that they are at least somewhat open to loosening their grip over what can appear on the iPhone it remains to be seen what kind of restrictions developers will have to work with in order to develop apps for the iPhone. On the geekier side of things, some people are hard at work on getting gnash, an open source Flash plugin, working on iPhone but this will likely have limited appeal and would only be a viable solution for people already hacking their phones. Tversity: A month or so ago, Tversity, a New Jersey based software company, announced that they had figured out a way to stream to the iPhone. Tversity's main product offering is a media server that allows you to stream all your audio and video content from your home computer to various web enabled devices (including many mobile devices and game consoles). I tend to think of TVersity as a variation on Sling Player or something similar to DotTunes but with many more features. After contacting Tversity we learned that they also have some products aimed at enterprise level clients and they do a lot of work providing media delivery solutions to various wireless carriers. Over time we've been able to do some minor tweaking with their product and we're very pleased with the results. We'd like to thank Tversity for helping us deliver what we believe is the first live streaming offering for the iPhone. Please let us know how this is working for you in the comments. I've been trying to figure out how to do this myself. Awesome! Woww! It's working really well. Currently listening to the 128k stream Anti Static podcast on wifi at work without issue. Very cool. Thanks, Doron et al. Just a thought on the built in radio and the iPhone. There are tax implications in Europe if you sell a device with a radio in it. I dicovered this when I bought a Sansa e260's . The hardware contains an FM tuner, but access to it has been disabled in Europe (EMEA region) on a software level due to the increased tax radio-capable devices attract. works beautifully over wifi; will report back with edge test. The iTunes store exists so that Apple can move more hardware, so it doesn't seem likely that Apple is avoiding streaming radio to sell more songs. More likely that people would be disappointed with the quality of the streams over the edge network. "Prohibited and Permissible Uses: Data Service sessions may be conducted only for the following purposes: (i) Internet browsing; (ii) email; and (iii) corporate intranet access ... EXCEPT FOR CONTENT FORMATTED IN ACCORDANCE WITH AT&T'S CONTENT STANDARDS, UNLIMITED PLANS CANNOT BE USED FOR UPLOADING, DOWNLOADING OR STREAMING OF VIDEO CONTENT (E.G. MOVIES, TV), MUSIC OR GAMES"
So could AT&T cut you off for streaming WFMU on your iPhone, or is it considered within "AT&T's content standards?" but now I am rocking out with FineWine!! I've been listening to streaming podcasts over my PSP for a couple of years now. But the wifi module burnt out, so I have no idea if they've added live streaming functionality to the latest firmware. The trick I still need to figure out is streamshifting, translating your live stream into a media server friendly feed that I can play over my home network MP3 player. Great Job! I can't wait till everyone starts using technology like this. Now if they would just integrate flash video (so many websites us it) that would be great! Doesn't really work for me, on Edge or WiFi. It keeps repeating the same 4 minute fragments. I'm having the same issue. Before, it wasn't doing that, but now it's repeating every few mins, or so. Same here. With the 32k stream over EDGE, it manages to play 5-7 minutes, then all of a sudden, it loops back around to where I originally started playing the stream. lol, all that hassle to get "the real, not watered-down version of internet". Thanks to everyone for the feedback and sorry to those that are having problems. We are currently working on the situation with Tversity to see if we can figure out why some of you are getting the looping problem. I'll post back here once I have an update. Listening to the 32K stream over EDGE and it sounds great. Thank you WFMU! You know, if you created another wml (mobile phone) page, those of us with regular cell phones could also stream your station. I've got AT&T prepaid and an unlocked phone and CAN'T stream anything at all (idiots, ATT not you) but anyone with an AT&T branded SonyEricsson walkman phone like mine can stream mp3s with a data account. I'd like to be able to stream KGO in San Francisco over my iPhone. Any chance you could hook them up?? Will this work on Iphone 1G? I have just downloaded the application, and have been using it - the thing that really annoys me is that if, for some reason it loses the feed, you have to press an OK button on a dialogue box that pop-up to 'start' it again. It would be a lot better if it could do this automatically - then I wouldn't have to get up and down from my chair. One of my co-worked built one of these. He further modified it so that it beeped like a geiger counter when the physical brakes are applied. This feedback can be used to maximize regen.